Are you in a situation where people around you, your customers, and your friends are talking about Instagram and advising you to be on it? Are you wondering if there is any potential ROI with Instagram for business use? Are you having a feeling that all the noise around you is just gaining more and more momentum instead of fading? 500 million active users and growing – With its active monthly user base, Instagram is posting more than 95 million photos/videos daily. With a large interactive user base, it presents as a great opportunity for all business types. Visual information is more engaging: With a visual edge to all your information, Instagram can boost engagement with your customers as more than 50% people respond better to visual media than plain text. More visibility of your posts: With face book’s organic reach, there is no guarantee your customers will be able to see your updates or newsfeed comments. And with paid marketing, it’s pretty hard for small businesses to compete with bigger brands. On the other hand, your posts appear 100% on your customer’s newsfeed with Instagram which means more visibility, more engagement, more branding. Increased Sales: Instagram community is increasing and businesses on it are obviously in for increased sales and profits. Huge opportunities for local-based businesses: Instagram gives you direct access to your customers. It gives you a target market based on location which can directly give you an edge over your competitors. Today, there less than 20% brands who are using Instagram for business, clearly showing that your competitors are slow in adopting it, directly giving you an edge to capture the market via this platform. Great engagement tool: Instagram is turning people into insta-content creators. With a smart phone and high quality camera, people are clicking and loading their everyday life moments. With mobile based photo editing apps available, a brand can easily run contests/campaigns engaging its audience and encouraging them to share content relevant for your brand in this media-rich environment. It’s not a teen platform anymore: Are you thinking, Instagram is only for teens and celebrities? A new survey results from Pew Research Center shows that Instagram has surpassed Twitter in popularity among US adults with 26% actively using it. A media rich environment, Instagram is surely changing the way businesses market their products and services, engage and interact with their customers. That is why it’s incredibly important for your businesses to create an Instagram profile and build its presence. If you have yet to create your Instagram profile, it’s time to start taking photos/creating videos for the world to see! Instagram undoubtedly is a highly effective platform offering various marketing benefits. Are you using Instagram for business yet or planning to use it in near future? 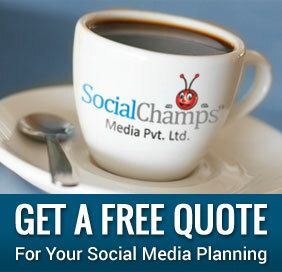 Do share your views on your expectations/experiences with this visually-rich social media platform. Why one should invest in Digital Marketing? Pleasure to hear the article served what you were looking for!